Maranda Dziadaszek (forefront) and her crew show off their culinary creations. Mount Mercy Academy students and staff participated in many service opportunities in October, but the school outdid itself in November, participating in a plethora of activities. This year, campus minister and senior theology teacher Mary Colby is asking members of the senior class to plan and coordinate a service project. During November five seniors initiated service projects and the school also had four other service activities. The school’s student government kicked off the month with a project they called “Sockvember.” The group collected 245 pairs of new socks for St. Luke’s Mission of Mercy. The senior class sponsored a collection of hygiene products and prepared 52 hygiene packs for the Buffalo City Mission. The students also included homemade cards for each of the packs. On Veterans Day, five members of the Class of 2019 delivered the packs to the mission. The sophomore class continued the school’s tradition of preparing pies for Journey’s End 1st Thanksgiving Feast, an event that teaches refugees about the American Thanksgiving and its traditions. Sophomore class moderator Leigh High and sophomore theology teacher Sister Jenny Wilson, RSM, coordinated and supervised the event. The students shopped for supplies and created the pies. Sophomore Aislinn Farrell (West Seneca), Mrs. High and her daughter represented Mount Mercy at the event. One of the Critical Concerns of the Sisters of Mercy is “standing in solidarity with immigrants,” and this event addressed the concern in a practical and caring manner. The final school event was a dress down day, one of the activities the school sponsors to raise money for Catholic Charities. Senior Amanda Radwan (West Seneca) sponsored a service project at Queen of Heaven parish to make blankets for Gerard Place. Radwan and her committee of Mount Mercy students helped create 45 blankets which went to St. Luke’s Mission of Mercy, as well as Gerard Place. Classmate Meaghan Lopez (Orchard Park) led a group of seniors at St. Bernadette Parish that helped pack groceries for families in need. Lauren Zimmer (Hamburg) initiated a service project at Munchkinland Day Care Center. Lauren and her helpers spent time playing with the children as well as do some outside clean-up work. They also donated hats and mittens for 25 children. Samantha Batchev (Lackawanna) organized an afternoon of board games for the sisters at the Mercy Center. Rounding out the senior service projects was preparing a dinner at the Ronald McDonald House. 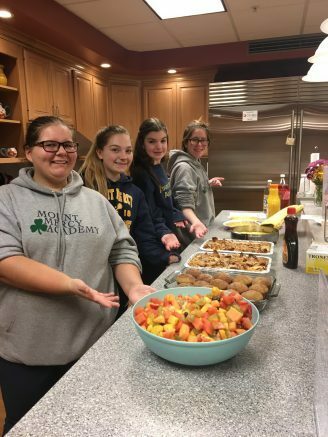 Maranda Dziadaszek (Buffalo) and her volunteers prepared dinner for the guests at the Ronald McDonald House. They developed a theme of “Breakfast for Dinner” and cooked a French toast bake, frittatas, banana muffins and fruit salad. The Mount Mercy community continues to follow Catherine McAuley’s vision of compassionate service and affirming the dignity and uniqueness of individuals. Be the first to comment on "Mount Mercy Academy continues its service to the community"